Let your hearts open,"the Grandmothers said. "We understand that to see the suffering in the world, in the Americas, in the Middle East, in Africa, in so many places," they said, shaking their heads,"is painful. And to see the hardened hearts of those you call 'the haves'..." they laughed ruefully, "those people are most pitiable of all. In their hearts they have nothing and though they clutch at everything, they end up grasping at emptiness. "So," they said, gazing at me, "take the challenge and let your hearts open. Feel what you feel. Let compassion well up in you and then serve wherever you can. Serve with your hands, your voice, and with your listening. Such service will bring you joy. "Cast the Net of Light," the Grandmothers said. "Hold it and let yourself be held by it. Pray for all creatures affected by the catastrophes taking place all over the world and hold them in the Net. That is your job. The holding, holding, holding of the light. "You have been conditioned by the energy of yang to expect things to happen fast," they said, "but the shift of energy you will create when youhold like this will endure a long time, do lasting good. By your decision to 'hold,' you will lift the heavy conditions on Earth. You will lift Earth itself. "You are needed to do this steady work and you are needed day in and day out," they said. "To do this, you need the stamina the Net of Light gives, and as you develop this stamina, you will become stronger and able to do more. Living from this steady place inside yourself will give you greater and greater joy." You may copy this message, but please include our website address. Thank you. Ancient culture foretold a time when God the Mother would return to Earth. With the process of ascension fully underway, many masters are now remembering the souls with whom they shared their previous incarnations. 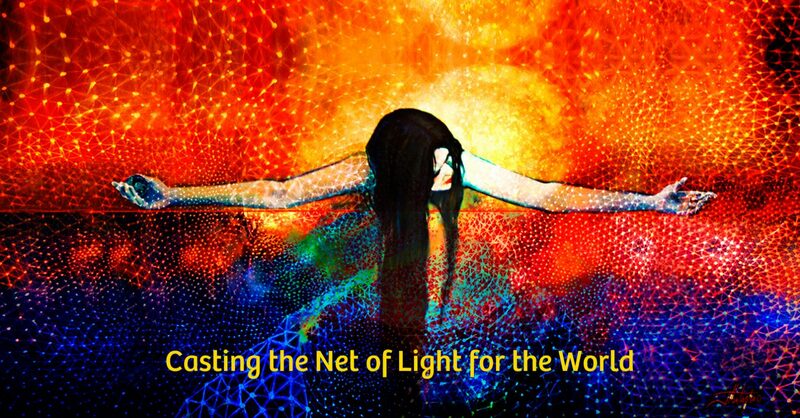 Vast soul groups, all coming from the same Monads, original divine sparks, are drawing together to anchor their soul light into powerful pools of energy. Working together instinctively, these clusters of people are drawing higher spectrums of Source light into the specific areas where they live. This is speeding up the higher vibration of the planet and allowing it to be fully anchored. This in turn is clearing large bands of collective karmic energy from countries that need purification. When the souls working in this way consciously focus their intention on this vision - it speeds the process. To become a walking master, you must undergo and pass a considerable number of challenges and initiations. For those who have been waking slowly, this has been a long process. A rapidly awakened master, however, will have worked through their tests unconsciously. To these souls, understanding and realization come instantly. They instinctively embrace the universal flow as the true workings of Source become reality. Energy and information are immediately channeled to them via the fifth-dimensional heart chakra, offering a higher angelic perspective. There is a feeling in the air of being in a new space energetically. The best way I can describe it is “there are no walls”. It is like energy from everywhere is streaming in and this makes us really sensitive physically, emotionally, and mentally. Many are just feeling fed up with it all. It can make one feel as if they want to stay in bed with the covers up over their head allowing the world to pass them by. For me, it has felt like at times there is too much input to the point where my form becomes overwhelmed and needs to shut down with sleep or quiet time to where I can literally stare at the walls for hours. I asked to be shown what is happening and the understanding I was given helped tremendously so I am sharing this with you now. They showed me walking through a dense forest. The forest was cool, and the sunlight filtered in softly. The path was not huge but it was visible and clear. We could go off the path but there were signs and symbols pointing us back each time we ventured off. Then the forest path opened to a giant field. The sun was blazing, almost painful to the eyes in the sharp contrast. I could not see a path at all and I felt this bombardment of energy. It made me want to slip back into the softness of the forest. When I really looked at it it was an infinite number of layers of realities, information, frequencies, beliefs, streaming in and out of the field. Like being in a room covered head to foot in TV’s all playing different stations. I responded “How can this be? There is no path. It feels like it is too much; like it is all noise. It makes me want to shut down. How can I know which direction to a walk in this sea of confusion?” I was completely overwhelmed. I began to really feel my heart space and breathe in and out through it. In just a couple of breaths I began to feel better and my mind stopped racing. To my surprise a path began to appear in the field! The more I settled into my heart space the more the path became clear. It also started to create a force field around me that blocked all the noise out. It was then explained that the only way to move forward now is to be fully grounded in the heart space and from that space determine what you want. Each person has their own path, their own field of potentials. Figuring out what you do want and do not want is essentially choosing what streams of potential you want to allow into your form. They did warn that one can feel paralyzed by all the energy (sitting and staring at a wall) if they are not operating from a grounded heart space. So when you feel completely overwhelmed take a few minutes and make sure you are not allowing too much in. This energy will see people making big changes, from location, career, relationships, even about your physical health. Follow the nudging as spirit is assisting us, it is just really noisy and feels unclear unless we are in our hearts. The clearest way I can explain it is to say “If you don’t follow your heart, all will fall apart.” The heart space is our true guide. Video - "The Healing Chambers of the Archangels Re Here For you Now !